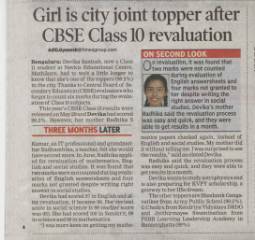 Devika Santhosh is city joint topper after CBSE Class 10 revaluation. Abheek Dutta of Grade V from Navkis Educational Centre has received a Gold as well as a Silver medal in Viva Cup 2019 South Zone Taekwondo Championships in two different categories under 40 kgs. "Proud to be a Navkian"
FROM NAVKIS TO PHOENIX, ARIZONA..
Madhura Kumar showcased her project titled "A Holistic Approach to Measuring Noise Pollution" - Differential impacts of transient and white noises using pattern recognition at a National fair conducted by IRIS - Initiative for Research and Innovation in STEM from 2nd to 4th Dec, 2018. 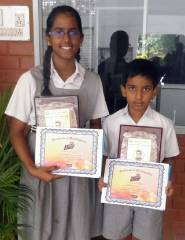 She has won the Broadcom Masters special Award in IRIS 2018. She has been selected as a Delegate for excellence in Science, Technology, Engineering and Math. 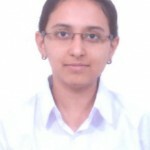 She is going to represent India along with 20 students at ISEF 2019 in the month of May in Phoenix, Arizona, USA. 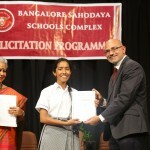 Bangalore Sahodaya School Complex conducted Felicitation for the Subject wise toppers of Grade XII. 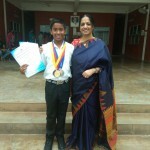 Mohith Kumar Scored 100/100 in Mathematics. 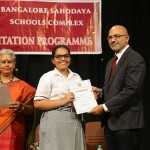 Bangalore Sahodaya School Complex conducted Felicitation for the Subject wise toppers of Grade X.
Anagha Kalyani Scored 100/100 in Science. IQGNANA FOUNDATION conducted NLTSE for the academic year 2017-18 from Grades 1 to 10 . Level 1 is called as Elementary level .Following are the winners of the Gold, Silver and Bronze Medals. Times Spark was a Scholarship Exam conducted under the Read to Lead programme - an initiative of the Times of India. Over a span of three months, one article per day was published in the paper across a range of fields like current affairs, science and technology, global development etc. At the end, there was an online test on the 7th of Jan 2018 and followed by an interview on 20th Jan 2018 at TOI office. 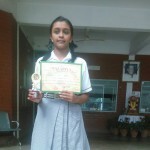 NAVKIS is proud that Shruthi S Kamath of Grade XI has been one among the 300 students to be chosen from all over the country with an education grant of Rs 1 Lakh. Satwik Shankar takes NEC to glory by adding yet another laurel. He participated in the Shishir Kittur Memorial State Ranking Badminton Championship held at Agon Sports Hennur in Bangalore from the 18th June to the 24th June 2018 and bagged the Singles and Doubles Title under thirteen category. NEC family congratulate him on his achievement. Kartikeyan Nair is the young achiever in swimming conducted by the Karnataka Swimming Association 19th State short course Swimming Championship 2018,held at Dr. Shivram Karanth Balavana Swimming pool, Puttur from 6th to 19th December 2018. First place in 4* 25mts Freestyle. South Zone Aquatic Championship 2018 held in Sir Vizzy Municipal Corporation swimming pool, Gandhinagar, Vijayawada from 27th – 29th December. He has been recognized as the Top Sports Talent of Karnataka 2018 for his excellence, efforts and his achievement in Sports. We are proud to announce that Navkis Educational Centre is awarded by Gomatic India Pvt . Ltd. Stepp Karnataka 2018 , KHEL Foundation as the 'Top Sports supporting Educational Institute of Karnataka 2018'. Our NEC students from Grades 1 and 2 participated in the Puppet Making competition held on 29.01.2018. 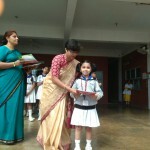 Children from all the sections of grade 1 and 2 took part in the competition with great zeal and enthusiasm. The teachers and students were all had great smiles during the making of the puppets. The children showed their creativity by making puppets of varying sizes, shapes and materials. The children made finger puppets, paper puppets, sock puppets, bottle puppets to name a few, with a lot of patience and interest. It was a captivating moment when all the puppets were displayed. The judges had a tough time deciding the winners. Overall, it was an enjoyable and successful event. in the Karnataka Swimming Association - State Sub Junior and Junior Aquatic Championship 2018 which was organised by Mysore District Swimming Association, Mysuru. 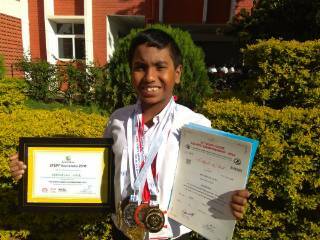 After having secured several laurels, the Bruce Lee of our school Dheemanth.T.Gowda of Grade III B took part in the 8th SKDUN KOHAI WORLD CUP held in SUBOTICA,SERBIA between 09th – 11th October, 2015.This little star stood tall by securing the 3rd position in the individual championship. 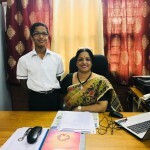 The school wishes him every success in future. Australian National Chemistry Quiz, ANCQ was held on 23rd August 2017 for students from Grade VII to XII in which 95 students participated. We are very proud to announce that Tejas Varma of Grade VIII A, Medha P Nallur of Grade VIII B, and Aryahi Anil Kumar of Grade XII A have secured high distinction with 97 percentile. These students were felicitated at MSRIT Bangalore on 8th February 2018. We are glad that Principal Lalitha Murthi was chosen as the Best Principal of the Year 2017 for Bangalore zone. At the recently held Vifa Cup 2018 open South Zone Taekwondo Championship Parmita K of grade VI B won the Gold in Kyorugi event and Silver in the Poomsae event in the under 40 kg - colour belt category. At the recently concluded All India Sub Junior ranking Badminton tournament held at Gulbarga, Satwik Shankar of Grade VI C secured the runners up position in the Doubles and Bronze in the singles respectively. 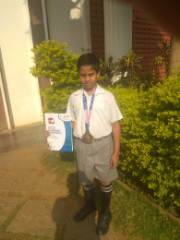 He also was the winner in (doubles) in All India Junior ranking held at Hyderabad . Dhanya.S and Rithesh.s of class III & VII had participated in Dance Competitions and they had achieved First,Second and Third place .Event was conducted by Rangashree Kala Samasta at Orbit Mall, White field ,Bangalore. 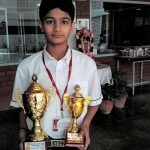 Tejas Varma a child prodigy of class VIII from NEC stood first in the city in the National Aptitude Challenge conducted by Byjus in collaboration with Times NIE in the academic year 2016-17.. He earned a four days educational trip, from the 14th of November to the 21st of November 2017 to USA. 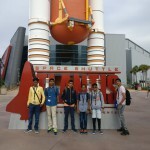 He spent three informative days in the Kennedy Space Centre and a day full of fun and frolic in the Disney World , Orlando, Florida. The school is really proud to have such a bright student. Paraaga of Grade IX won consolation prize in Nazariya drawing competition. 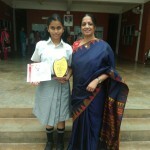 She was one amongst 5000 students from 500 schools who participated in the event. 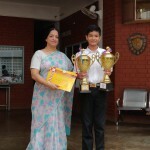 Students of Grade III, IV and V took part in Karate and Taekwondo Championships and won various trophies. Navkis is proud of you all.